MonsterVerse Monsters: Who do you want? Which Kaiju do you guys want/think Legendary will use in the upcoming MonsterVerse movies? my top 5 that we don't already know about would be..
And if Toho decides to make another Godzilla movie post Godzilla vs. Kong, could we possibly get another Kaiju movie in the MonsterVerse not involving Godzilla? 54 Responses to MonsterVerse Monsters: Who do you want? I think it would be cool if they could have either Gorosaurus or Fire Rodan in the Monsterverse. I personally would rather see obscure monsters make an appearance. Shin Godzilla maybe, but other than that... Any Kaiju that does NOT tie him into the Japanese backstory for Godzilla. Let's be honest with ourselves here, the movie was disappointing at points. There was only about 20 minutes of KAIJU actually in it. 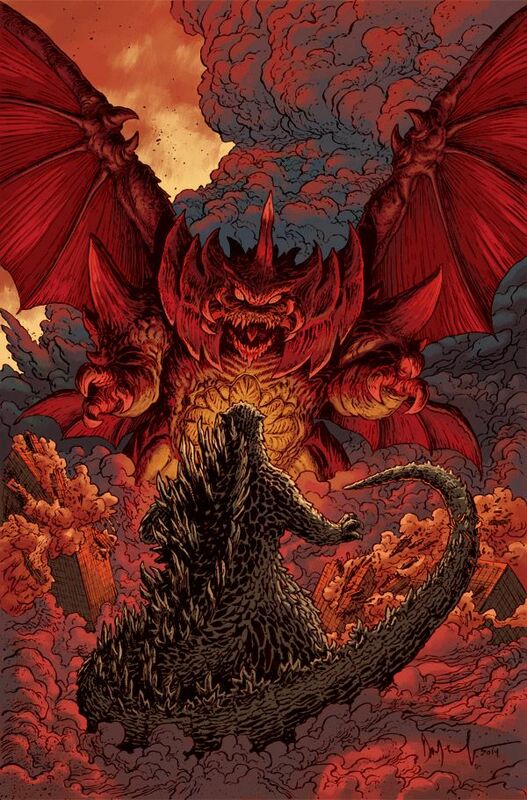 If we add any main series Kaiju from the more famous Godzilla backstory, for example... Destroyah in my case... They would butcher how incredible these Kaijus really were/are. Your favorite Kaiju story could get ruined by how they make the movie. It's America film making vs. Japanese film making afterall, keep that in mind. Anyway, my choice would be Shin Godzilla. It would define them as being different and also give us a great Godzilla vs. Godzilla fight we all want already. I just noticed that you're new here so welcome to the forum! Maybe introduce more new monsters? As much as I'm happy to see Rodan, Mothra, and Ghidorah getting a Western makeover, I'd like to see original creations. The M.U.T.Os were cool, but I think Hollywood can make something really neat for the larger pantheon of kaiju in the series. I think the MUTO's are cool looking but I think their design resembles to much like the Cloverfield monster in a lot of ways. I would like to see new MUTO monsters, but if I had to pick from some old school kaiju from TOHO? I would pick Gigan, Hedorah, Megalon, Destroyah, Biollante. As much as I would love to see new monsters, I just don't think they would bring that "star power" that say, Destroyah or MechaGodzilla would have. I guess I wouldn't mind seeing Destoroyah again since 1995 was the last time we saw him. I mean Destroyah would be a cool monster to see, but maybe Legendary might create an original monster that might also be created from the Oxygen Destroyer. ^I don't think it would be right to give another monster the same origin as Destroyah just for the sake of it being a new monster. It'd be fine if it were a new monster created by something entirely different. Oh and about Fire Rodan, YES. Let me remind you, I once asked for Ghidorah on these forums long before the 2014 movie even came out and look what happened. Ask on the Godzilla-movies forum and you shall receive. As far as we know, Legendary does not have the rights to any more TOHO kaijus to use in this trilogy. As much as we would all love to see Destroyah, I have my doubts that Legendary will bring anymore TOHO characters in. So I think Legendary will go with the legal route and feature a new monster in GvK. Wouldn't be surprised if they decided to create a brand new kaiju for GvK movie. ^I agree with you on that. I would love to see a classic Toho kaiju in there somewhere but until we hear otherwise of a classic kaiju then all I can speculate is that GVK will feature a new MUTO if they plan to have Kong and Godzilla fight together against a common foe. Personally tho, I would like to see a less use/obscure Toho kaiju make an appearance in the future installments of the MonsterVerse, If they decided to continue after GvK, maybe if both GKOTM and GvK did well at the box office then I can see both Legendary and Toho renewing the movie rights. You mean something like Baragon or Varan or even the Kamacuras? I think the most likely toho monsters are MechaGodzilla, and maybe Destoroyah. Moreso MechaG. As for who I'd like, King Caesar, Titanosaurus, and Biollante are who come to mind. @rigzzamortis86 Legendary confirmed new Kaiju only 3 months after the success of Godzilla 2014 if that says anything. @Im Durp I think the deciding factor on whether we get Destroyah(ruling Mecha G out for now) depends on whether Ghidorah dies in this film or not, and of course how well the film does at the box. I don't see MechaG as the most likely because he is in no way linked to the Oxygen Destroyer. Now, if Ghidorah has ties with aliens, that's a whole different ball game. In my mind, I think any of the Kaiju you are thinking of would fit perfect into a Kong movie. Kong vs Varan would be sick imo. Throw gorosaurus/anguirus/manda in there and you've got a winner. I don't really think he needs to be related to the oxygen Destroyer to show how likely he is. That comes from the fact he's toho's most popular monster yet to be confirmed in the legendary universe. If legendary is going to use toho's monsters chances are they're going to go for the ones that already have some type of marquee value. @Im Durp I realize that he is the most popular that is yet to be confirmed, but I'm going off of what information we have so far, none of which seems to really relate to anything MechaG. I hope I'm wrong though, the original bad guy MechaG is due for a remake. TBH I'm happier with classic monsters showing up than new ones. Hollywood nowadays is very desperate and are constantly making pathetic attempts at bringing back franchises. I mean looking at the Mutos, they're perfect examples. Hollywood is to scared to step out of the box so they just make the same monster, it's Cloverfield but an insect. Unless we got some really creative wheels spinning I think making new monsters is going to turn out bland. To be fair, many of Toho monsters are also bland. So getting back to which monsters we should see in the Monsterverse, I think that Battra should appear in GvK since Mothra is appearing in GKOTM. What Toho did with the limitations of suits is light years more creative than what Hollywood has been doing with monsters and their over-produced CG over the last two decades. Arachni-tiles invade Hollywood! At least Pacific Rim and Colossal moved away from the Hollywood arachni-tiles. I'll take the novelty of three headed monsters, cyborgs with hook arms, upright, horned larva creatures and mechanical doppelgangers over spiderlizards every day. Battra should appear in MonsterVerse Mothra film as a villain. There should also be an article on which Toho kaiju people would want to see the least of in the Monsterverse, such as Hedorah or Minilla or even Orga. While I agree with the sentiment @Gman, I'd rather see the Monsterverse make new monsters that don't necessarily become classics then see rehashes of the old favorites. It'd be fun to see an original Monsterverse creature make their way to a Toho film actually. I've always been partial to seeing new things than getting the same old stuff again and again, especially if new and/or interesting things aren't attempted.